Lyle and Erik Menendez, who were convicted of murdering their wealthy parents in a nationally-televised 1994 trial, appear to be sitting courtside at Madison Square Garden in a Mark Jackson 1990-91 Hoops trading card. eBay has begun pulling listings of a fairly common and inexpensive 1990-91 Hoops basketball card featuring former New York Knicks guard Mark Jackson following the revelation that notorious killers Lyle and Erik Menendez appear to be seated courtside in the photo. According to sports trading card magazine Beckett, eBay has begun to pull listings of the Jackson basketball card, telling sellers it is against the website’s policy to sell an item affiliated with murders or serial killers. Former New York Knicks guard Mark Jackson's 1990-91 Hoops trading card, with Lyle and Erik Menendez (far left) seated courtside in the background. Despite the emails, there were several listings for the basketball card on eBay Tuesday morning. One seller even had a lot of 30 cards with bids above $340. There are also listings of sports cards for players who have been convicted of murder, including former Panthers wide receiver Rae Carruth and former Patriots tight end Aaron Hernandez. “From what we’ve been hearing, eBay doesn’t like being associated in news stories as the place to sell your memorabilia and novelty items of serial killers,” said Ryan Veres of Burbank Sportscards, which continues to sell the card for $34.99. Veres said he hasn’t yet been told to pull down the card from eBay, but noted that five to six owners of other stores selling the Mark Jackson card reached out to him after receiving the same email from the online marketplace. “This item just happens to be the most popular at the moment,” Veres said. [eBay] should take a broader stance if that is their stance. Menendez brothers Lyle (left) and Erik during their 1994 trial, in which both were convicted of the 1989 shotgun murders of their parents, Jose and Kitty Menendez. The Menendez brothers were convicted of killing their wealthy parents in a high-profile trial in 1994 that was broadcast nationally on Court TV. The trial revealed that weeks after their parents' murder in Beverly Hills, Lyle and Erik spent the insurance payout they received in a buying spree that included a $64,000 Porsche, three Rolex watches, and the purchase of Chuck’s Spring Street Cafe in Princeton, N.J., which Lyle renamed Mr. Buffalo’s in hopes of franchising its chicken wings nationwide. 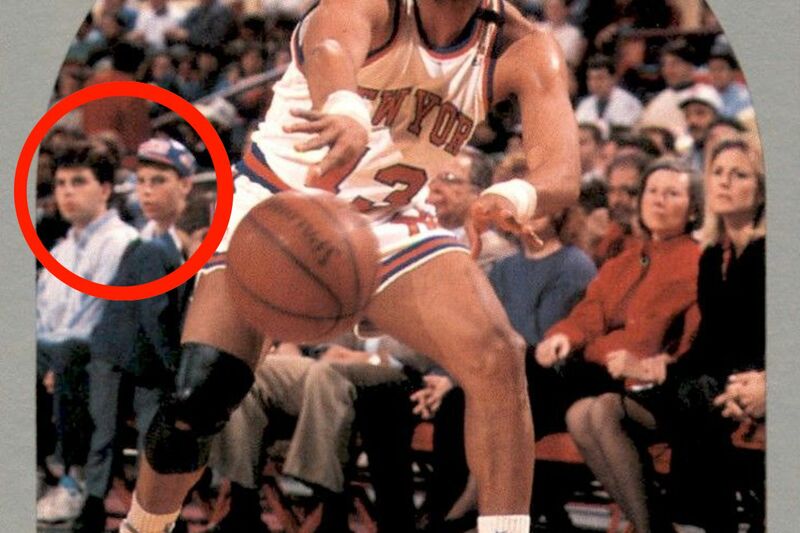 Sleuths on Reddit were first to notice the Menendez brothers seated courtside in the background of the basketball card. Action Network’s Darren Rovell later confirmed the photo was taken at Madison Square Garden during the 1989-90 season, meaning the brothers would have been watching the game during the seven months between when they killed their parents and were arrested. As Beckett points out, this isn’t the first time a notable cameo has appeared in the background of a sports card. The 1994-95 Pinnacle card of former Ottawa Senators left winger Sylvain Turgeon features a young Patrick Kane, more than a decade before Kane would go on to win three Stanley Cups for the Chicago Blackhawks and be named one of the 100 greatest NHL players in history. The 1994-95 Pinnacle card of former Ottawa Senators left winger Sylvain Turgeon features a young Patrick Kane (far right) seated in the stands.